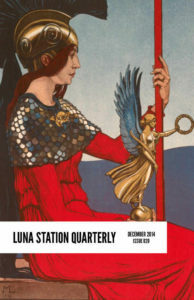 The twentieth issue of Luna Station Quarterly has an enchanting mix of science fiction and fantasy tales. Women and girls, scary, beautiful, smart, alien, and often all of the above, fill these pages. Come for a vist, and you may even meet a little red alien who feels rather familiar.